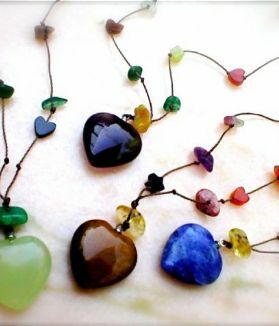 There are a choice of different stone hearts with all mixed stones around it. I have designed this piece to bring pleasure and joy through their energy and colour. You can state colour waves such as bright pale, pastel or earthy tones. These always look great on little girls too. To place an order go to the order form and scroll past the numbers and you will find your word reference. I will call you when you order to confirm colours and sizes. thank you.